Chris Pappan tells us about the tradition of Native American ledger art. Chris Papan, one of the most renowned and unparalleled exponents of Native American art at the time, explains some key elements to understand his art. 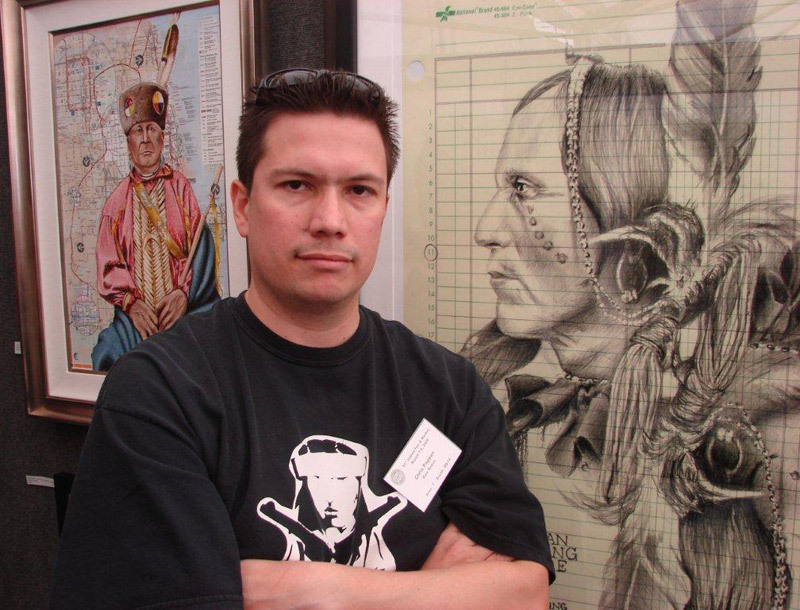 Chris Pappan has managed to portray the complex history of American Indians in an array of different media, among those, his pencil drawings have gained much recognition due to its excellent craftsmanship, elegance and precision. He has participated in numerous highly successful exhibitions in the United States and Europe that provided him with a reputation for both high quality and conceptual depth. An enrolled and proud member of the Lakota/ Kaw and Osage indian tribes, his art serves as bridge between the traditional and the contemporary world, making him, in addition, one of the most relevant indigenous living artists of today. AWG: Tell us about your roots and how those roots find a way into your artwork, specially in your pieces showcased in Art Wanson Gallery. What is the meaning behind your figures and the people that you draw? Who are they? Are they members of your family or historical figures that shaped your community? CP: Manifestation of Destiny is about indigenous resistance in the face of immeasurable oppression. The figures aren’t anyone I know (sometimes I will draw my ancestors). All of the figures I draw are from historical photographs, but a lot of times I look for obscure photos of people who challenge what the majority of people think a Native American shouldlook like. I also look at clothing, different textures, and expressions of my subjects when choosing them. Sometimes I feel also that I will connect with them on a spiritual level, and if they want their spirit to be known, then the drawing will flow naturally. If they don’t want their spirit to come back, then I will have difficulty drawing them, and I have to be sure to listen, and respect their wishes. AWG: ¿What have you tried to portray in your piece entitled “Intertwined”? CP: Intertwined alludes to the idea of casinos and how people think it’s a cure-all solution for a nations/community’s economical challenges. The central figure is rendered similar to a figure on a playing card, while the pattern surrounding him is from the back of an actual playing card. I have also included map collage, representing our ties to the land (or sovereignty) and gold leaf, representing both beauty and the lust for wealth. AWG : ¿What is the message behind your piece “Crossroads”? CP: Crossroads features the figure of a Sac & Fox man. The Fox were once prominent in the Chicago area where I live and I find their aesthetic wonderful, and its similarity to the Kanza (my tribe). Many of our ancestors were forced to make choices that affect us today, and they were aware of that. Sometimes their choices didn’t have the outcomes they were hoping for, and may have had regrets, but we’ll never know. The colors are sacred colors of my people and represent the importance of tradition, but the circles represent spirits as stars, a contemporary abstract approach. AWG: Tell us about the use of antique paper in these drawings currently showcased at Wanson Art Gallery. Why do you choose these materials, specially the antique papers? Which is your favorite material to work with? CP: Manifestation of destiny and Intertwined are done on ledger paper and Crossroads is drawn on Santa Fe railroad stationery. I am continuing the tradition of Native American ledger art. In the mid 1800’s when the U.S. was expanding westward the invaders brought ledger books with them. This was the introduction of paper to the plains nations and they found it to be a suitable substitute for creating on deer and buffalo hides. Originally the imagery consisted of the year’s past events for a tribe (a.k.a. winter count) but once forced onto reservations, and their old way of life in ruins, the ledger page was a good way to recount the details of a life that would never be the same.